When you stop at Starbucks to grab your morning latte, have you ever thought about how many coffee brands there are and how you chose Starbucks as your go-to? Is it the mermaid logo? The tall, grande and venti cup sizes that the baristas personalize with your name? Or a store design that makes you feel like you’re enjoying great coffee with friends? The point is we live in a world where there are millions of brands to choose from every day, whether we are buying a new car, shopping for shoes or even just grabbing a bottle of water. That makes exploring and understanding branding as a woman and small business owner really key to your relevance and success. 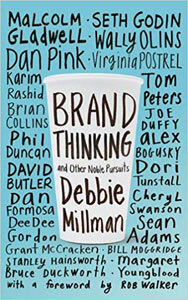 The book Brand Thinking and Other Noble Pursuits by Debbie Millman is a forum on the state of modern branding and how companies and consumers can best understand the behavior behind why we brand and why we buy. It contains 22 interviews with the world’s leading designers and thinkers in branding, including Malcolm Gladwell, Tom Peters, Seth Godin and Wally Olins. The interviews contain spirited views on how and why humans have branded the world around us. Is it a simple differentiator of the products on our pantry shelves or in our closets, a manipulative tool forced on us by corporations or a creative triumph as capable as any art form of stimulating emotions and intellect? Read the book and decide for yourself and your business!